First up, uninvite those pesky MOSQUITOS – They won’t stand a chance at feasting on your guests if you arrange to have the grounds sprayed by a professional company like Mosquito Nix or Mosquito Joe. You should also plan to have natural bug repellant available just in case. I love these repelling bracelets. 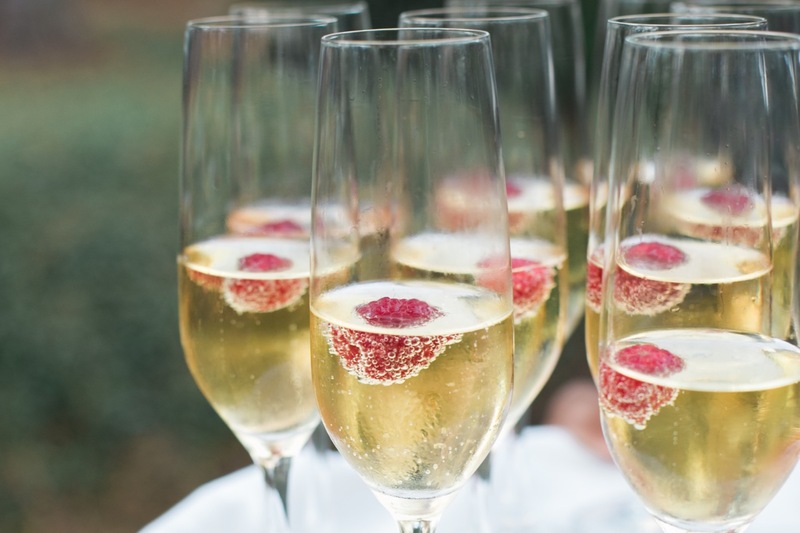 Serve up Pre-Ceremony Beverages – Whether it’s a hot summer day or cool afternoon, serve up something refreshing and delicious to your guests as they arrive for your outdoor ceremony. Fruit infused sparkling water, hot tea bar, bellinis or hot toddies…you choose the sips (or spirits) and your guests are sure to delight. 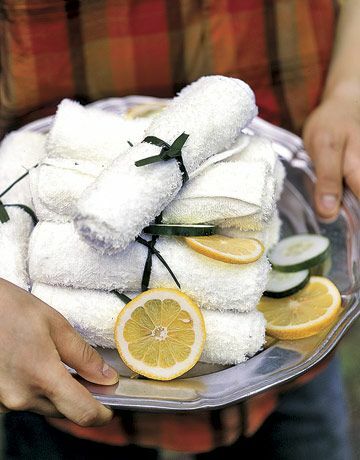 Butler pass chilled towels infused with lemon or eucalyptus oil while guests are waiting for your beach ceremony to begin or during your cocktail hour if taking place outdoors. 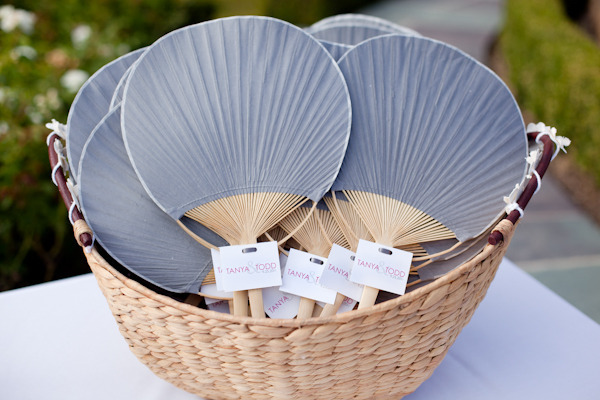 Rent several large white patio umbrellas to provide added shade for your outdoor ceremony. 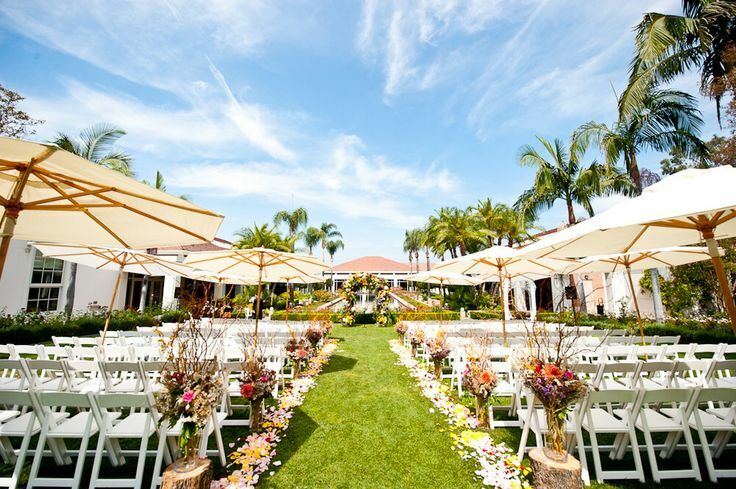 Dress them up by having your florist wrap the poles in greenery or wrap the bases in large nautical rope, depending on your setting and design concept. 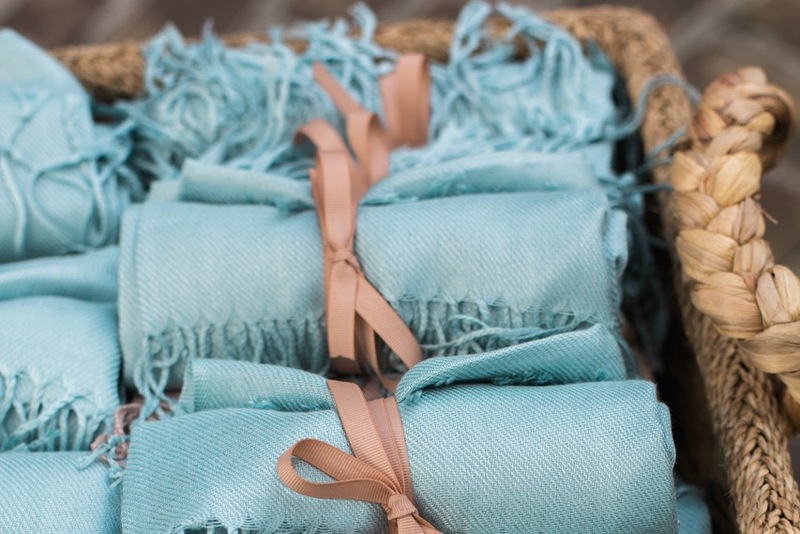 Pashminas in your wedding color palette serve as a beautiful little detail that will keep your guests warm all day and night. Ranging in price from $5 to $50, you can decide how lavish they’ll be. For outdoor reception, consider placing a rolled pashmina on every other seat or draping them ever so beautifully over your ceremony chairs. Another great way to keep guests warm at your outdoor wedding is to hire a local company to setup a portable coffee bar and serve up signature lattes and cappuccinos. Throw in a dash of Bailey’s and a display of delectable sweets and your guests will delighted. 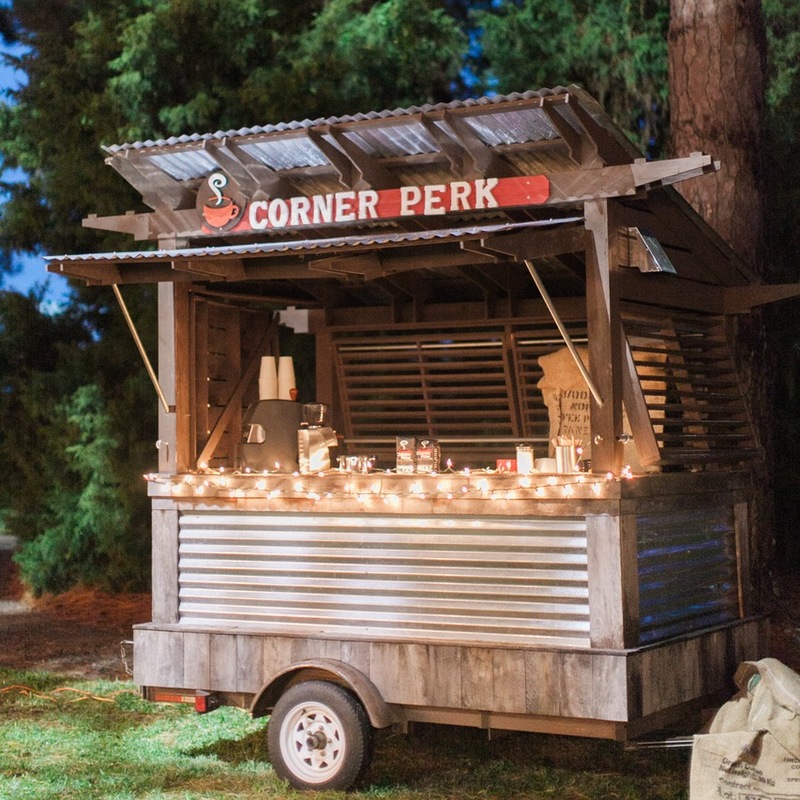 I love this coffee cart from Corner Perk that Meagan and Chris had for their wedding last fall at Oldfield. Don’t forget to rent space heaters if the temperature is expected to dip below 60 degrees. 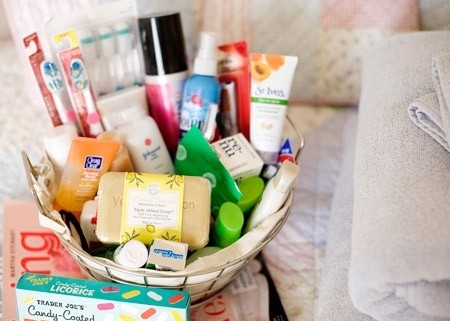 Create a Beautiful Bathroom Amenity Basket – These are provided for your guests in case they have a minor emergency or just need to be refreshed. I love displaying the items on a beautiful tray with a softly scented candle and petite floral arrangement. I wrote a post about what your basket should entail. Provide Comfortable Shoes for Dancing – Some guests will grin and bear the pain of their Jimmy Choo stilettos, but others will be ready to kick off their heels as soon as possible. No one wants to see bare feet in their wedding photos and we surely don’t want anyone to step on broken glass! 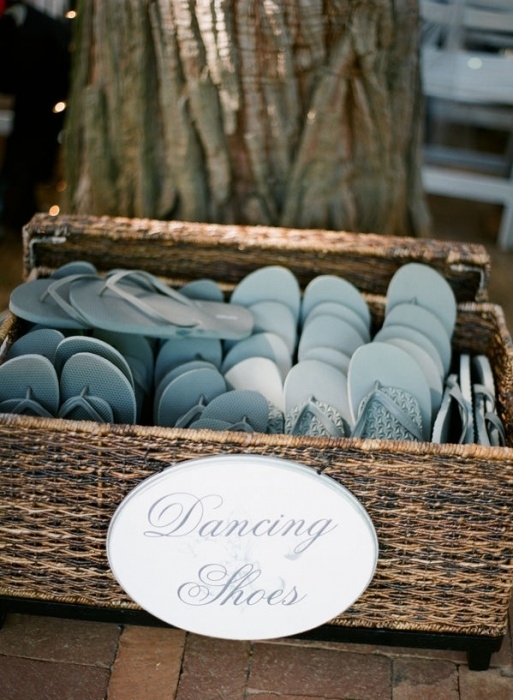 Keep your ladies happy by providing a basket of flip flops in near the dance floor. Go with gold or silver (if available) since the colors blend with any color palette and coordinate with all dresses.